Ticket prices are as follows: $20 Adult, $15 Sr/Mil/Stu.. Tickets will be available two weeks before opening night. For more information or to reserve tickets and pay at the door call: (520)-904-8054. Tickets and a copy of the charge receipt will be held at the performance location, available for pickup on the day of the performance within one hour of curtain time. No audio, video recording or photography is permitted. We do not give refunds under any circumstances! All sales are final. We do not offer refunds on credit card purchases, but will gladly exchange your tickets for a different performance of the current production, with 24 hour notice, subject to seat availability. Call us at (520)-904-8054 to arrange exchanges. The plays perform Thursday thru Sunday April 6, 2018 – April 22, 2018. The performances will be held at The Community Playhouse, 1881 N Oracle Rd. Tucson, AZ, Thur., Fri. and Sat. Performances at 7:30pm, Sun. at 2pm. Ticket prices: $20 Adult, $15 Sr./Mil./Stu. 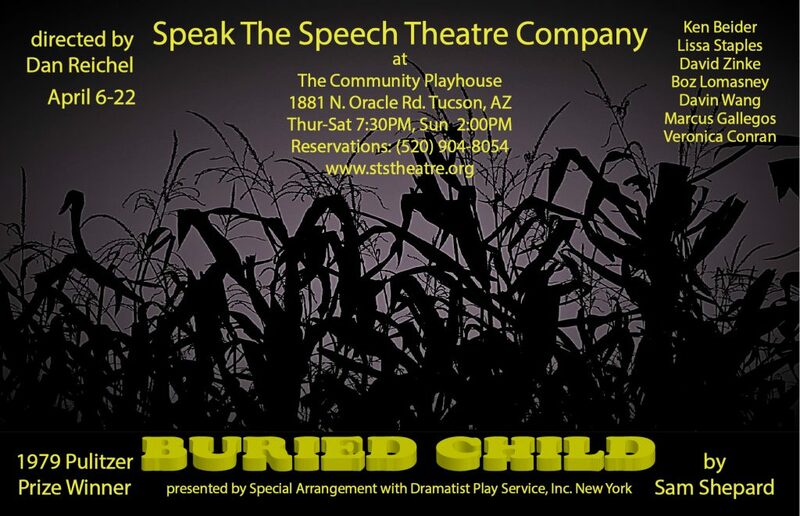 For reservations or information, please call Paul Brunelle at (520)-904-8054 or visit ststheatre.org.